A nose piercing with a small stud is one of the most beautiful and feminine piercings. Presently when most of the piercing enthusiasts are going the offbeat track you can choose to opt for a traditional simple nose stud piercing to set yourself apart from the crowd. At a time when most of the people are going for more exotic piercings like a septum piercing, you can surprise everyone with a simple nose stud on your nostrils by going the traditional way. Treading the conventional path is more unconventional now and with this a beautiful and elegant nose stud on your nostrils you will prove it right. 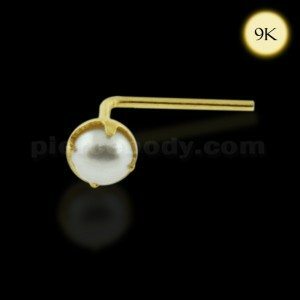 The 9k gold L-shaped pearl nose stud is a wonderful item offered by Piercebody. Gold is always the most favorite metal which has an inherent glow making any jewelry item look amazing. This nose stud is also no exception. The gold nose stud weighs 22g and will fit snugly on your nose. The visible end of the nose stud will have pearl set in prong. Pearl in yellow gold is a rare combination and renders a charming balance to the nose stud. The golden glow of the body is balanced beautifully and flawlessly by the pristine charm of the white pearl. This nose stud has the best from both glamorous and elegance aspects. The nose stud is a very girly thing and is the best accessory for the girly girl. Quite unassuming in nature, the cute little nose stud will render a subdued elegance to your personality. It looks quite classy especially with the pearl set in the middle. If you wish to give it a twist, then instead of teaming it up with gowns or other ethnic wear, put on a striped skirt along with a white top and see the difference. From the classic you will become cool and chic. Nose stud may be a tiny nose stud accessory but it can help revamp your look. It is quite versatile in terms of appearances. Whether you wish to look elegant or bold, a nose stud can help you out in that department. If you wish to have a hippie chic look, crop your hair short and make way for double or triple nose piercings and on the other hand if you wish to look extremely feminine like a newlywed bride, tie up your long tresses into a French roll and wear the nose stud with an elegant gown.